On December 4, 2009, Bruno Lemaire, the French Minister of Food, Agriculture and Fisheries, had a meeting with several manufacturers from the Dieppe region on the premises of the ADSI Company. The meeting continued with a tour of the GAULT Industries site. GAULT Industries has been committed to gaining ISO 14001 certification since September 2009, and has successfully passed the milestone of the first audit. The next step is expected in late 2010, with the final goal of obtaining IS0 14001 certification in early 2011. GAULT Industries has extended its stock of machinery with the acquisition of a new 50-tonne 2 metre AMADA 7-axis CNC bending press. 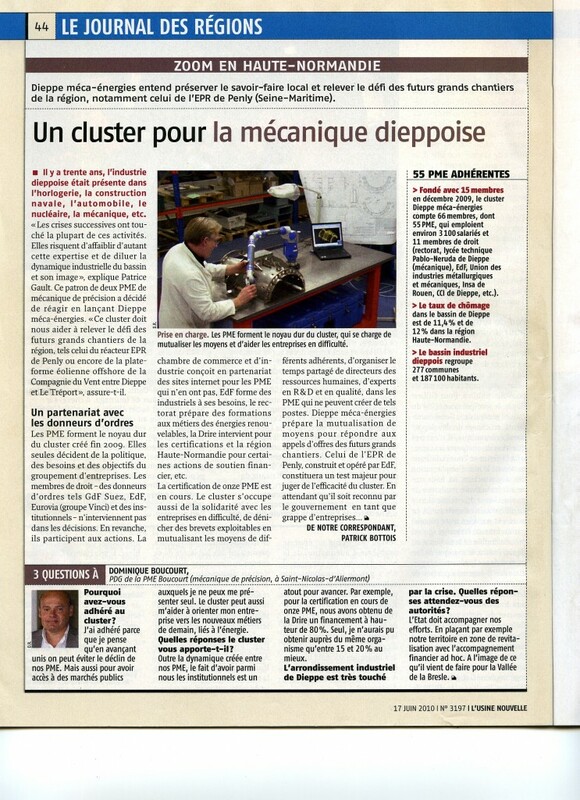 Usinage DIEPPOIS has extended its stock of machinery with the installation of a new 5-axis machining centre. The centre is able to machine the upper surfaces and sides of a part in a single operation, and allows manufacturing of 3D parts. After replacing the CAD software and licensing SpaceClaim ®, our Engineering Department is to integrate the new WICAM ® PN4000 software. Our objective is to reduce the programming time for our four punching machines and to improve our responsiveness by productivity gains. The ADSI company has recently acquired the ADOBE ® CREATIVE SUITE ® 4 (InDesign ® CS4, Photoshop ® CS4, Illustrator ® CS4, Acrobat ® 9 Pro), to optimize production and processing of your computer files. Usinage DIEPPOIS has just changed its software for backup and control of machining programs by acquiring Cwork 4 ® from the SMCOM company. Local business leaders are located in the heart of the cluster : they will define the activities and decide on the pace of the process. The company projects are supported by a network of federated participants within a steering committee. Participants in the technical development project must share a culture of supporting the project. The PG Group will be present from 2 to 5 November 2010 at MIDEST (the world’s biggest trade fair for industrial subcontracting).